Now available on DVD. David Leadbetter, renowned for working with the world’s top golfers has designed a DVD aimed at improving a novice’s game. Computer graphics have been combined with footage taken from all the key angles, to give the clearest possible understanding of the golf swing and how to correct common faults. Also covered are the essential components of the swing set-up, grip, posture, and alignment. 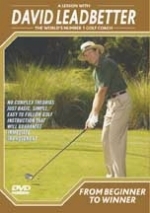 By teaching you the fine art of pitching, chipping, bunker play and putting, Leadbetter instructs you on how to cut shots off your score when you are close to the green. Good course tactics are imperative to playing good golf. Key areas covered include developing a routine, picking strategic targets, club selection and “swing thoughts”.